Linda Burton posting from Salt Lake City, Utah –The smell draws you in, it wafts out to the street and fills your car. It’s nearly suppertime, so stop already! There is plenty of parking or a drive-through if you have to get home. I’m going into Crown Burgers on North Temple, even though I don’t eat hamburgers. A place that smells this good has got to have good food, I think. I order a Single Chicken Souvlaki at the counter, with lemon rice and salad. While I’m waiting for my number to be called, I read a framed and matted article hanging on the wall; it came from the NY Times, 2009. The article touted the delights of the Pastrami Burger, a piled-high meat-on-meat delight that originated here. Well, partly. There is more to the story. 1978. 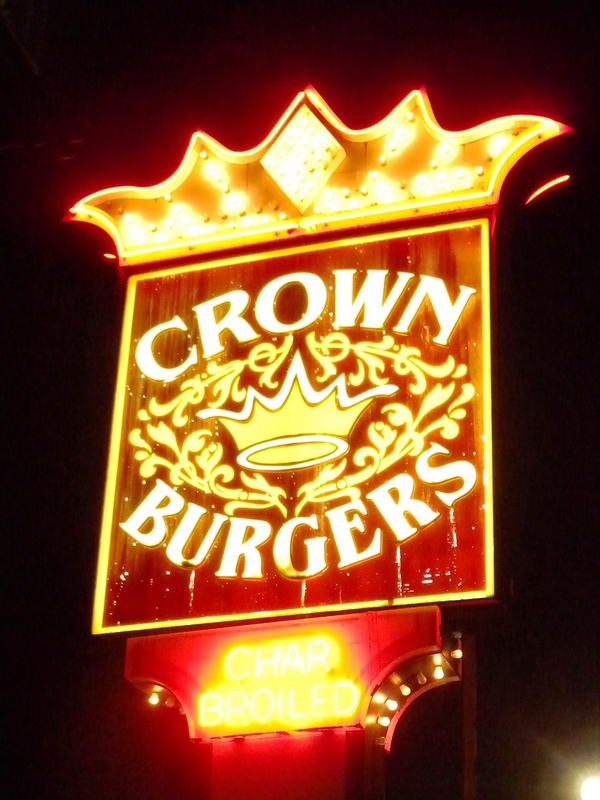 The first Crown Burgers opened in Salt Lake City. Nick Katsanevas and John Katzourakis started work at 3 AM every morning, doing the prep work for their homemade onion rings and chili. In a month they say “people were lined up like a train outside”; they tore the building down in a year and a half and built a bigger one. 2012. 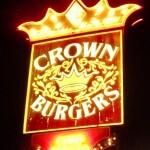 There are 7 Crown Burgers around Salt Lake City. They still serve those homemade onion rings, and burgers and fries; also fish, chicken, and a little bit of Greek; gyros, souvlaki, that tasty lemon rice, Greek salad of course. Everything is fresh, every day. Stand at the front counter grills and watch your food being cooked up, just for you. Sounds fine, and it is. So, when did they start making that famous Pastrami Burger, their signature item? Let’s go back more than a hundred years. 1907. The currant crop in Greece failed. Many Greeks began to migrate to the United States. Michael Katsanevas, a native of Kampous, in the White Mountains of Crete, wound up in Utah in 1909, and found work in a Utah asbestos kiln. 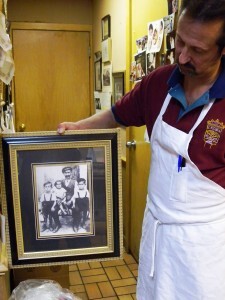 He became an American citizen after serving in WWI, and in 1920 opened a coffeehouse in Salt Lake City. In the decades that followed, he returned to his native home, but finally settled in Salt Lake City for good in 1948. Most of his 11 children entered the restaurant business. 1960’s. The Katsanevas clan was running the Athenian, a supper club where Liberace was a regular. They had bouzouki music and belly dancing with steak and lobster. It was an era when Zorba the Greek was a popular movie, so the appeal was high. But what about that pastrami burger? I’m coming to that. During this time Michael’s son James learned to build pastrami burgers from a Los Angeles man of Turkish descent. At least, that’s the way the story goes. 1970’s. 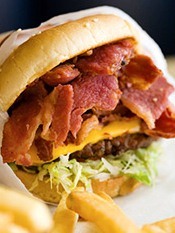 James founded Minos Burgers in Anaheim, California, where he renamed that Turkish pastrami burger The Zorba! Now, I’ve already told you that Crown Burgers was opened in Salt Lake City in 1978 by Nick and brother-in-law John. But that was not the Crown Burgers you see today. There is something besides the food that makes these restaurants special. 1982. In an effort to really distinguish the enterprise, an interior designer was hired by the name of Ken deCondé. Mr deCondé told them “If you’re going to be the best, you should look the best.” They hung French and Belgian tapestries, pulled chandeliers from the old Claridge hotel in Paris, got a cuckoo clock from the Black Forest in Germany. Do today’s Crown Burgers look elegant? Luxurious? 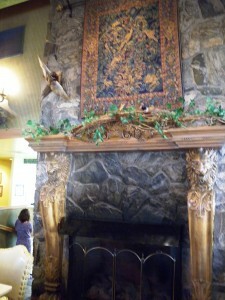 They do have a hunt lodge feel. 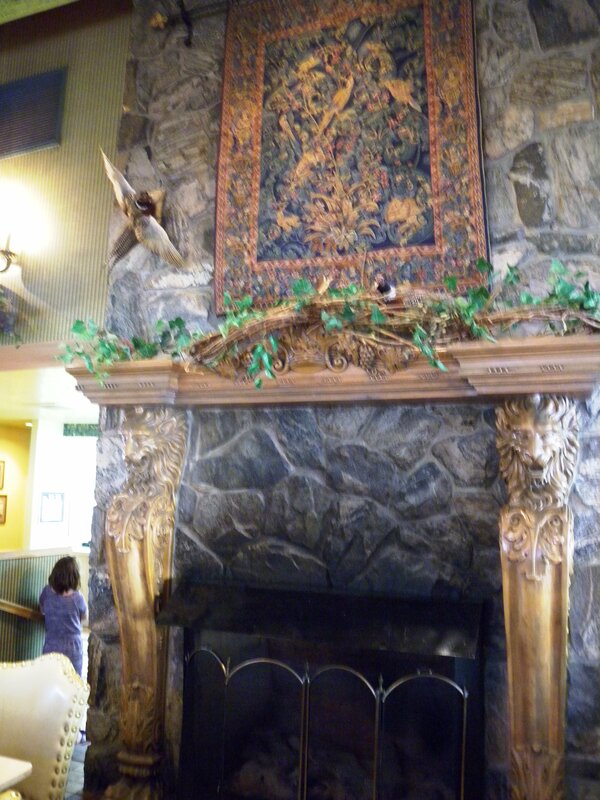 Wallpapered in dark greens, adorned with plants and statuary, the surroundings add extra flavor to the food. There’s a fireplace, there are booths, and there are tables and chairs. Nice soft padded chairs. 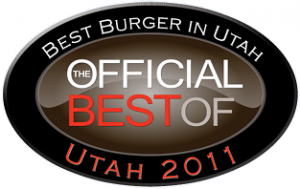 As for that Pastrami Burger, it was voted Utah’s Best in 2011, and likely will be again. It’s been imitated; you can get pastrami burgers at other places. But you won’t have a Crown Burger, and you won’t have a fireplace. Put a quarter-pound cheese-topped charbroiled beef patty on a sesame seed bun slathered with a thousand-island-like sauce, add lettuce, tomatoes, and onions, and crown it with a quarter pound of thin-sliced pastrami. Eat.